Home > Cat Bites More Dangerous Than Dog Bites? Cat Bites More Dangerous Than Dog Bites? When it comes to animal bites, you’re much more likely to suffer from a dangerous infection after being bitten by a cat than by a dog. According to the results of a new study released recently by Mayo Clinic researchers, cat bites, even though they are much less common than dog bites, are much more likely to end in dangerous infections that can have serious consequences. According to the study, patients who suffer cat bites often have to be hospitalized due to their injuries. The results of the study were published recently in the Journal of Hand Surgery, and indicate that at least two-thirds of persons who suffer a cat bite require surgery to remove all traces of infection from their wounds. The study focused on 193 patients who had suffered a cat bite wound. 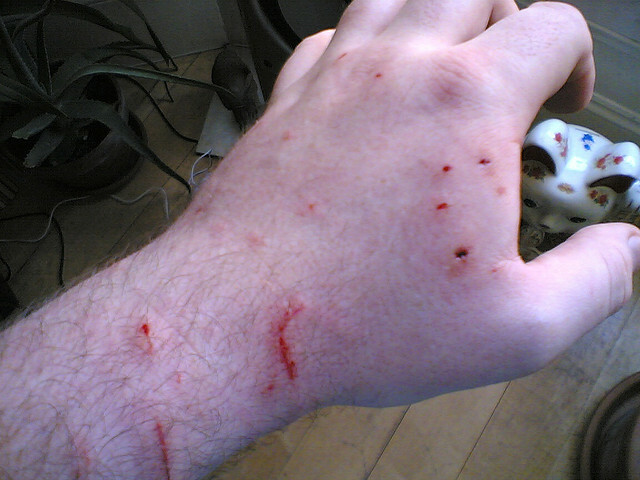 Unlike dog bites, which mainly seem to affect young children below the age of five, middle-aged women were found to be the most common victims of cat bites. It’s not as if cats harbor more dangerous bacteria in their mouths than dogs do. It is simply the fact that feline fangs are very sharp, and comprise small sharp teeth that can quickly penetrate the skin to dig deep inside. Those teeth are able to push deep into the person’s muscles and tissue, causing an infection rapidly. Besides, there is the fact that people aren’t as aware of the dangers of cat bites. You are likely to rush to a hospital when you have been bitten by a dog, but would probably brush aside a cat bite. Some types of bites seem to result in a much greater risk of hospitalization and multiple surgeries. Patients who have suffered a cat bite directly over the wrist, or near any joint, have a much higher risk of being hospitalized for their injuries. The hand and wrist joints seem to be particularly at risk for the breeding of dangerous bacteria. Bites in this area seem to take a much longer time to heal. If you or a loved one required medical attention after a cat attack, you may be entitled to compensation for your injuries. Call us today at (800) 644-8000 for a free consultation.